Aymenn Jawad al-Tamimi, a research fellow at Middle East Forum's Jihad Intel project, is one of world's leading experts on the Islamic State (IS) group terrorizing Iraq and Syria, also known as ISIS. The overwhelming majority of his writings and translations are too detailed or esoteric for distribution to a general audience, so instead MEF compiles periodic updates providing links and summaries for those who wish to follow the groundbreaking work of this prolific researcher. For other research summaries and more general interest writings by Jawad al-Tamimi, click here. Jawad al-Tamimi argues that IS documents and publications show respect for the four traditional schools of Sunni jurisprudence and that many of its actions, however heinous, "can find a place within the vastness of Islamic tradition." Translation and Analysis of a statement from the Sunni jihadist group Jamaat Ansar al-Islam, which was based primarily in Iraq until its disintegration in the wake of last year's IS advance across the north of the country, with elements of its Syria chapter continuing to operate in a limited capacity. The statement eulogizes Abu Ahmad of Mosul, a leader of the group's Iraq branch reportedly killed by IS. Translation and analysis of a statement by Muqawama Suriya, a pro-Assad militia led by Turkish-born Alawite Ali Kayali. The statement illustrates "growing war weariness among pro-Assad circles" in the wake of recent losses in Idlib province, notes Jawad al-Tamimi, while its emphasis on "popular" and "national" forces "implicitly acknowledges some of the increasing resentment in regime circles that the war effort is too dependent on foreign irregular forces." 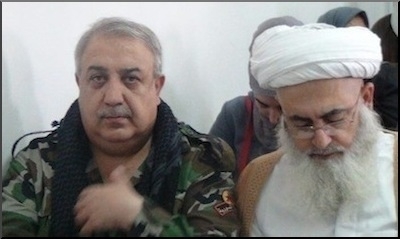 Translation and analysis of an interview with Akram al-Ka'abi, the leader of Harakat Hizballah al-Nujaba (The Movement of the Party of God of the Outstanding), or HHN, an Iranian-backed Iraqi Shia militia that emerged in 2013, operating both in Iraq and in Syria via multiple front groups. The interview sheds light on several aspects of HHN, notably its open identification with Iranian Supreme Leader Ali Khamenei and ties with the Lebanese Shia Hezbollah movement. Translation of a musical chant (nasheed), produced by IS's Ajnad Media Foundation. One of the "darker" nasheeds, according to Jawad al-Tamimi, with lyrics such as "we sever off heads by the strike of the sword." Related Topics: Iraq, Radical Islam, Syria, Terrorism, War on terror | Aymenn Jawad al-Tamimi receive the latest by email: subscribe to the free mef mailing list This text may be reposted or forwarded so long as it is presented as an integral whole with complete and accurate information provided about its author, date, place of publication, and original URL.